Those looking for a quintessential Cotswolds escape in every sense of the word need look no further than this delightful bolthole in the centre of the beautiful market town of Broadway; a small-but-perfectly-formed mews cottage for up to four guests, hidden in a quiet backwater just a stone’s throw from Broadway’s main shopping street. With 200 years of history under its belt, this is real Cotswold-cottage living; a heritage-rich hideaway for holidaymakers looking to get under the skin of one of the Cotswolds’ most popular tourist destinations. Postcard-worthy exteriors greet you from the moment you step through the courtyard within which the cottage sits, with a stone carving on the wall dating ‘Aug 1, 1811’ giving you a good idea of the cottage’s impressive history. Inside, the cottage’s cosy, homely interiors blend the modern with the traditional, with plenty of nods to its heritage preserved in the exposed wooden beams, beautiful parquet flooring, original windows and Victorian equine artwork adorning the walls. Elegant yet comfortable, the real star of the cottage is its beautifully-maintained courtyard garden; a real treat for a cottage of this size and the perfect spot within which to unwind, sundowner in hand, after a day exploring the glorious Cotswold surroundings. Best of all, Broadway’s many boutiques, cafés and restaurants are all within a 2-minute walk from the front door. Stepping through the traditional stable door directly into a light-filled hallway, glimpses to the cottage’s heritage are evident in the whitewashed stone walls and parquet flooring found throughout the cottage’s ground floor, evoking a real sense of country-living as soon as you step inside. The shared living space of the house is accessible directly from the central hallway, giving the cottage a flowing, spacious feel despite its smaller size. To the right, a snug dining room with table for four and views to the cottage’s pretty courtyard garden can be found, leading through into a modest but well-equipped kitchen that sits at the cottage’s front. Perfectly petite, the kitchen manages to squeeze in all you’ll need for a well-catered stay, including a double electric oven, dishwasher, freestanding fridge/freezer and plenty of kitchenware; there’s even a tiny tea making station tucked within a handy wall nook. Stepping back through the hallway you’ll find a cosy living room and the main living space of the house, boasting sink-in sofas in calming country-cream hues and bright dual aspect windows, including a handy French door leading directly out into the property’s pretty courtyard garden. The cottage’s history here once again comes to life through the parquet flooring, statement stone fireplace - complete with Victorian-era favourite Staffordshire Dog ornaments – and traditional equine artwork; a subtle nod to Broadway’s history as a key coaching hub of the Cotswolds. Modernists needn’t worry though, with a TV and WiFi on hand to ensure you stay well and truly up to date with the 21st century during your stay. The ground floor also homes a handy cloakroom WC, hidden away beneath the stairs. 1 family bathroom and one toilet on the ground floor. Those looking for a quintessential Cotswolds escape in every sense of the word need look no further than this delightful bolthole in the centre of the beautiful market town of Broadway; a small-but-perfectly-formed mews cottage for up to four guests, hidden in a quiet backwater just a stone’s throw from Broadway’s main shopping street. With 200 years of history under its belt, this is real Cotswold-cottage living; a heritage-rich hideaway for holidaymakers looking to get under the skin of one of the Cotswolds’ most popular tourist destinations. Postcard-worthy exteriors greet you from the moment you step through the courtyard within which the cottage sits, with a stone carving on the wall dating ‘Aug 1, 1811’ giving you a good idea of the cottage’s impressive history. Inside, the cottage’s cosy, homely interiors blend the modern with the traditional, with plenty of nods to its heritage preserved in the exposed wooden beams, beautiful parquet flooring, original windows and Victorian equine artwork adorning the walls. Elegant yet comfortable, the real star of the cottage is its beautifully-maintained courtyard garden; a real treat for a cottage of this size and the perfect spot within which to unwind, sundowner in hand, after a day exploring the glorious Cotswold surroundings. Best of all, Broadway’s many boutiques, cafés and restaurants are all within a 2-minute walk from the front door. The Living Space Stepping through the traditional stable door directly into a light-filled hallway, glimpses to the cottage’s heritage are evident in the whitewashed stone walls and parquet flooring found throughout the cottage’s ground floor, evoking a real sense of country-living as soon as you step inside. The shared living space of the house is accessible directly from the central hallway, giving the cottage a flowing, spacious feel despite its smaller size. To the right, a snug dining room with table for four and views to the cottage’s pretty courtyard garden can be found, leading through into a modest but well-equipped kitchen that sits at the cottage’s front. Perfectly petite, the kitchen manages to squeeze in all you’ll need for a well-catered stay, including a double electric oven, dishwasher, freestanding fridge/freezer and plenty of kitchenware; there’s even a tiny tea making station tucked within a handy wall nook. Stepping back through the hallway you’ll find a cosy living room and the main living space of the house, boasting sink-in sofas in calming country-cream hues and bright dual aspect windows, including a handy French door leading directly out into the property’s pretty courtyard garden. The cottage’s history here once again comes to life through the parquet flooring, statement stone fireplace - complete with Victorian-era favourite Staffordshire Dog ornaments – and traditional equine artwork; a subtle nod to Broadway’s history as a key coaching hub of the Cotswolds. Modernists needn’t worry though, with a TV and WiFi on hand to ensure you stay well and truly up to date with the 21st century during your stay. The ground floor also homes a handy cloakroom WC, hidden away beneath the stairs. Bedrooms Upstairs, 2 well-proportioned bedrooms sleep up to 4 guests: Bedroom 1 The master bedroom of the house can be found at the top of the cottage’s staircase, boasting the same bright dual-aspect outlook that the cottage’s living room enjoys. An eye-catching antique French-style double bed acts as the focal point of the room; an intricate masterpiece in mahogany, featuring delicate carvings and four miniature posts to evoke a real sense of occasion. A generously-proportioned room, there’s also a built-in wardrobe, dresser and dressing table at your disposal, plus attractive exposed beams and a delicate tapestry adorning the wall to further emphasise the elegant, French-style feel. Bedroom 2 Across the landing sits Bedroom 2, with zip-and-link twin beds making it perfect for younger guests or adults who don’t mind bunking in together. Boasting the same refined, French-style theme of the Master, Bedroom 2 also benefits from beautiful bright interiors thanks to the dual-aspect windows overlooking the cottage’s frontage and beautiful private courtyard garden. It also homes a statement mahogany dressing table, built-in wardrobe and small sink behind the door; a Victorian throw-back that’s stood the test of time. Bathroom The cottage’s main bathroom can be found upstairs between bedrooms 1 and 2, with a double shower, attractive Victorian-style Chatsworth wash basin and wonderfully high ceiling, evoking a real sense of space within this family bathroom. Fully tiled with wood-effect flooring, a large window overlooking the cottage’s front floods the bathroom with light, boasting the same laid-back yet elegant style that can be found throughout the cottage. What’s Outside Hidden away in a somewhat secret courtyard just off Broadway’s main shopping street, Box Cottage is perfectly placed for those seeking the peace and tranquillity of a country escape, with the benefit of amenities on the doorstep. Pretty in equal measure inside and out, the cottage is accessed from the front through a kissing gate at the end of a quiet backwater, sitting pretty alongside a row of fellow mews cottages opposite an ivy-strewn dry-stone wall. The real gem of the cottage is its private courtyard garden, accessible via French doors leading from the staircase and living room. Encased by traditional Cotswold stone walls in typical courtyard style, this spacious outside area affords the cottage plenty of al-fresco dining opportunities thanks to a dedicated outdoor-dining set and charcoal BBQ sat beneath a beautiful Wisteria-strewn pergola; ideal for offering shade on sunny summer days. The perfect space to unwind in after a day exploring Broadway’s many boutiques, the courtyard is beautifully-maintained with plenty of greenery to give it a real English country garden feel. Facilities Parking on premises (one car) Wireless Internet Washing Machine Dishwasher Charcoal BBQ Outdoor Dining Area Iron Telephone Baby Cot 1.5 Bathrooms 2 bedrooms Amenities within walking distance Local Amenities Amenities are very much on the doorstep at Box Cottage, meaning you needn’t have to venture far for the essentials during your stay. The nearest convenience stores are in Broadway itself, with Warner’s Budgens and Nisa both within walking distance and stocked full of the essentials you’ll need for a well-catered break. The nearest major supermarkets can be found in Evesham (20-minute drive), where an M&S Simply Food, Tesco Superstore, LIDL, ALDI, Morrisons and Co-Operative Food offer you plenty of choice when it comes to stocking up. If you fancy taking the hassle out of your stay completely, we recommend planning ahead with a grocery delivery; Ocado, Sainsbury’s, Tesco and Morrisons all deliver to the cottage. Lovely, well equipped 2 bedroom cottage, set in an excellent location just behind the high Street (no traffic noise). No open fire but lovely and warm with plenty of hot water. Kitchen well equipped with fridge/freezer microwave and dishwasher and loads of plates, cups etc. Downstairs loo ( needs the lock sorting) but good sized bathroom and another toilet with good shower. Nice garden to rear although unfortunately not the weather to use it. Will definitely come back. Comfortable, pretty cottage in a convenient location, surrounded by shops and eateries, what more could one ask? The Bolthole instructions were lacking for The Hive so I was pretty cold for the first few days until a neighbor came to my rescue. After that it was toasty. This is a great place for a holiday! 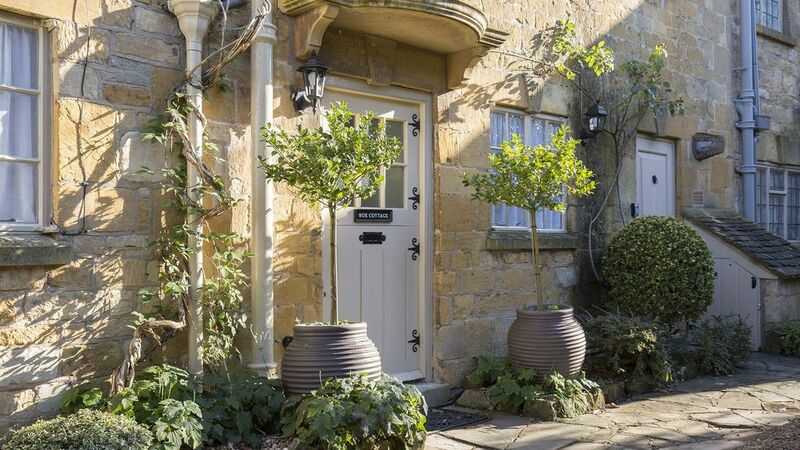 We love Box Cottage - it's the perfect Cotswold hideaway! We do a lot of walking and it's great to be able to walk straight out of the door and up to the hills without even thinking about a car. It's so quiet and secluded yet just a few steps from the bustling high street - a superb combination. As usual everything to do with the cottage itself was great, but this time we experienced a little difficulty with parking. This was partly due to the work being done on rebuilding the wall in the passageway - so can't be helped, I suppose. Amazing cottage. Just what I was looking for. Spent four nights in the town of Broadway. The cottage was perfect for our stay. It was so comfortable and cute. I would love to stay again!